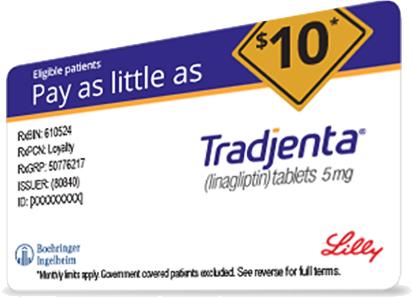 The TRADJENTA Savings Card is designed to help make TRADJENTA more affordable for your eligible adult patients with T2DM. The details of the program are outlined below. Looking to sign up a patient to help them start saving? *Eligible patients 18 years or older may pay as little as $10/month with a maximum savings up to $150/monthly prescription. Card valid for 12 consecutive months from activation date. Eligible patients may re-enroll for additional 12 consecutive-month periods by reactivating expired card, benefits not to exceed program expiration on May 31, 2020. If you live in Massachusetts, card expires on the earlier of June 30, 2019, or date AB-rated generic equivalent is available. One card per patient, not transferable, and cannot be combined with any other offer. Program not health insurance. Only valid for commercially insured patients in the 50 United States, DC, and Puerto Rico. Not eligible if prescriptions are paid for in part/full by state or federally funded program(s), like Medicare Part D, Medicaid, Vet. Aff., Dept. of Def., or TRICARE and where prohibited by law. Offer may change at any time, without notice.